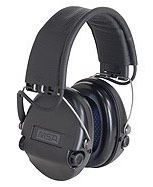 The MSA Supreme Pro sound control earmuffs are as far away from just “earmuffs” as can be imagined. These are high-end, Swedish manufactured sound enhancement systems. Not only do they protect your ears by compressing noise levels above 82 decibels, they dramatically enhance your hearing, giving you up to four times the volume level of the things you really want to hear in a hunting environment: leaves rustling, a branch cracking. To give you an idea how effective they are when at full enhancement, I can hear my refrigerator running from my bedroom, and I don’t have a noisy refrigerator. Just scratching the back of my dog’s head sounds like sanding a block of wood. The audio quality is that crisp and clear. U.S. Special Operations Command awarded a $21 million dollar contract to MSA back in 2005. This was for the Sordin AB technology “Ranger System” used by U.S. Special Forces units, Army Rangers and ground troops in Iraq and Afghanistan. Unlike inefficient sets that require four, or even six, AAA batteries to power, the Sordin Supreme Pro requires just two. The two AAA batteries go into an elegant, waterproof battery compartment and provide an astonishing 600 hours battery life, which is double that of other units. The circuit boards are lacquer-coated to be weatherproof. These hearing protectors do not just “clip” or cut-off sound, they compress them down to the 82-decibel range. This is done with what Sordin calls an ASIC, or Application Specific Integrated Circuit. The reason to consider these units is not just passive hearing protection, for all kinds of Chinese sets can do that. The great appeal of the Sordin Supreme is sound fidelity and hearing enhancement. Combined with their low-drain, extremely long battery life and weatherproof construction, they are ideal for extended use, when the crackling of the small limb you could not hear before may be the trophy you are after. Copyright 2009, 2013 by Randy Wakeman. All rights reserved.